Every year, the Bundesverband mittelstandischer Kuchenfach handel (German Association of Mid-size Kitchen Retailers), BMK Dusseldorf, awards an innovation prize for special product innovations. 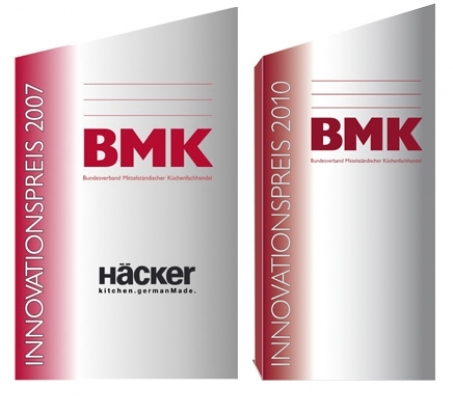 In 2007 Hacker Kuchen received a prize in the kitchen furniture segment for its “silent-move” product and in 2010 again for its emotionNOVA line. Silent-move: this irresistible creation is kitchen design on the highest level. It delights the senses with its unique minimalistic design – for all those for whom the special is not unusual enough. Aesthetic eye-catcher: base units without handles, fronts in cappuccino high gloss, and wall units in floral glass as a delicate, playful contrast. “Silent-move compact” is the unbeatable finishing touch – a system of worktops in 12-mm thich granite that move smoothly , almost floatingly. Closed, it forms a contrasting frame for the base units that house the hob and sink. Open, it provides access to these functions and invites you to sit down in an elegant design dream that is turned into reality in 13 granite variants and seven synthetic stone varieties. emotionNOVA: Thinking across borders, changing vantages, questioning expectations: the cmotionNOVA project started with these key terms. Designer Dietmar Hentschker’s aim was to strip the fitted kitchen down to its functions and rebuild it along the lines of “beauty put to good use”. The result is a kitchen system. Based on functional elements, it clearly belongs to the avant-garde in designer kitchens. The working areas of emotionNOVA are bordered by a passe-partout of furniture offering ample the stricter interior design. Every one of the 28 functional areas appears as an individual, framed sculpture – sometimes light and floating, other times strikingly cubic. For planners, this opens up new architectural dimensions when creating kitchens with sophistication.